Every four years, I find myself predictably caught up in the World Cup, only to lose interest in the game after it’s all through. How can an American without a satellite dish really keep up with an international sport like soccer, with multiple leagues to watch spread across several continents? With the Internet, of course, but it doesn’t quite feel the same as being able to watch regular games (er, matches) on television, which is the only secondhand way of experiencing sports that I’m used to. I think I understand much more than the average American does about the European leagues, but it still seems like more work than I’m ready to put in. As it is, I’m a pretty casual fan of baseball and basketball, an extremely casual (and extremely recent) hockey follower by circumstance — I probably would have grown up as a Blackhawks kid if only they’d had an owner who didn’t outright despise the fans — and have more or less sworn off any future interest in American football. In the case of that latter case of self-denial, has that ever spared me from a lot of stress that I’ve found myself more than content to do without. Despite my halfhearted commitment to keeping up with them, I really do love sports, although for completely different reasons than I did when I was young. I’m too old to idolize professional athletes, and seriously doubt that I’ll buy another personalized jersey or overpriced pack of cards ever again. I can’t stand the celebrity culture of sports and how the media continually tarnish what should be one of the last innocent and pure activities in our society with it. No, growing up has pretty much purged every interest I once had in the cult of sport out of my body, even as it’s steadily grown into a viable armchair lifestyle for millions thanks to behemothian media giants like ESPN. I have no use for the babble that makes up this world or the personalities that have made their millions contributing to it. But as I’ve struggled on my own to make my way in the world, I’ve grown to really appreciate the value of an individual’s hard work, especially when it’s in the service of a truly difficult and specific goal. When I see a truly great play in any sport, I’m more appreciative than ever of the incredible physical efforts, complex split-second calculations. and total mental focus it required, all under the sort of pressure that I’ve rarely had to experience in my easygoing life. In short, it’s an everyday chance to witness people living up to their full potential. Or (perhaps even more admirably) repeatedly failing to do so, only to get up and try time and time again until they finally succeed. This is why I love the World Cup, which gives me a chance to watch a sport that I reasonably understand (but haven’t watched enough of to grow truly jaded of) and which offers no shortage of chances for me to witness such displays of courage and extra effort. I watched all of the United States’ match against Algeria (in Spanish on Univision! ), both teams’ final match of the group and a must-win for the US to advance. I was glued to the screen from the first half on, and as the second half wound to a close with both teams still scoreless, I couldn’t bring myself to give up despite the extremely unlikely chances that the US would have the time to mount a strong, last-minute attack. At the end of 90 minutes, with only three (four?) minutes of stoppage time left, their fate seemed sealed, even moreso as Algeria began the extra time with a strong scoring chance of their own. What happened in the next minute was only possible because every member on the American squad remained totally focused on their goal and unwilling to let the odds against them deter them from punching through and pulling off one of most memorable victories in our country’s history to date. Sports may be a time-wasting diversion 99% of the time, but when they let us witness such a rare display of perseverance in the face of adversity and the value of a spirited second-effort, they’re as indispensable to our culture as music, art, or any of the forms of expression that we usually turn to for inspiration. Unfortunately, our good fortunes weren’t to last, being knocked out by Ghana last week. With England out as well I’m left with Japan as the last team I could find any personal stake in rooting for. That is, until I saw the picture above. 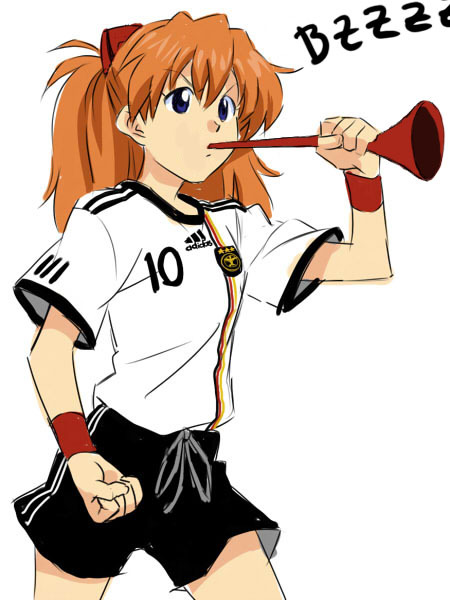 Is Asuka in a kit blowing a vuvuzela reason enough to root for Germany? On its own — as it very well could stand and still be a great short/one shot manga — the epic first chapter of Eden: It’s an Endless World! was enough to get me on board for the entire series. But it was the establishing shot at the beginning of chapter two sealed the deal. Quique is one of my favorite albums, certainly not an unheard or lost masterpiece by any means, but an underground classic if there ever was one, and hardly the sort of thing album that you ever actually encounter anywhere in the world outside of the Internet or a record shop. So imagine my surprise when, in the background of this scene in an abandoned shopping mall (? ), next to the advert for “Calvan Klein” that Elijah is admiring, a poster for it suddenly grabs my eyes. I can only presume that Hiroki Endo himself is a fan; it’s not as though he used it because it was a recognizable, iconic image that would help set the scene, so he had to have other reasons. 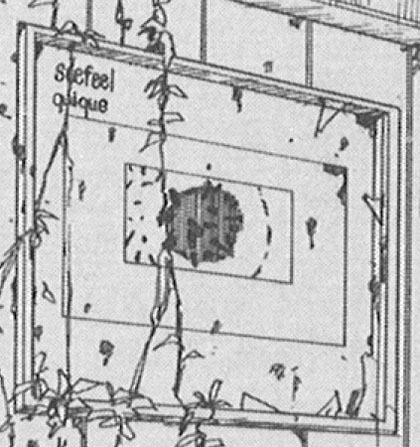 Odd how Seefeel’s general approach to music — building techno grooves and loops using traditional instruments treated through electronics — seem echoed in the themes of Eden: cybernetic humans, technology vs. nature, the cycles of entropy and collapse, etc. I’d like to think that maybe it inspired some of the feel of the books, and I don’t think that’s out of the question. 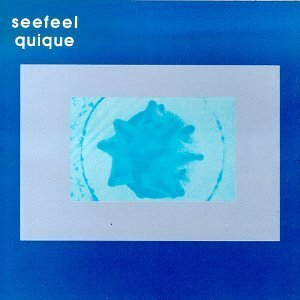 Plenty of bands have tried to pick up where Seefeel left off, but Quique still sounds unlike anything else: a little otherworldly, kind of lonely, but with a soul and a warmth that still shines through. And if nothing else, it’s a fitting soundtrack to Eden‘s woebegone and solemn beginnings. Maybe every generation looks at the state of the world and wonders if the end is near. Humans of centuries past lived through plagues, famine, and genocide, all under the watch of vengeful, merciless gods. Thanks to vaccines, systems of social support, and technology, we’ve slowly freed ourselves from those real and imaginary burdens (at least in the “developed” world, or wherever you’re likely reading this right now), only to find ourselves facing a new set of threats of our own creation. In this respect, the sort of anxiety we feel over nuclear annihilation, global warming, peak oil, or zoonotic flu is nothing new, but with respect to all our ancestors, maybe it’s more deserved. I know that sounds grim, but it’s hard not to think about such things while the Gulf of Mexico is slowly turning brown right before our eyes. What will happen if this keeps up — “this” being carbon increasingly emitted into the sky, oil released into the sea, superviruses mutated beyond our control, you name it — and what might the world look like afterwards? I’d been morbidly preoccupied with these thoughts for years, and that was before I read Alan Weisman’s The World Without Us. In a way, while I long for a world where society would finally embrace peace and sustainability, a part of me delights in the aesthetic appeal of a post-human planet and the inevitable return of nature to the countless zones where it’s been paved and exterminated out of existence. There’s no shortage of this in the opening chapters of Eden: It’s an Endless World!, and it’s as gripping a portrait of a planet in transition as I’ve ever seen. Set in the aftermath of a global pandemic, a trio of survivors take shelter in a research lab, scavenging from the ravaged and deserted land around them and living off the provisions of their self-sufficient facility as they ponder the possibility that they might be among the last survivors on earth while waiting for contact from the outside. 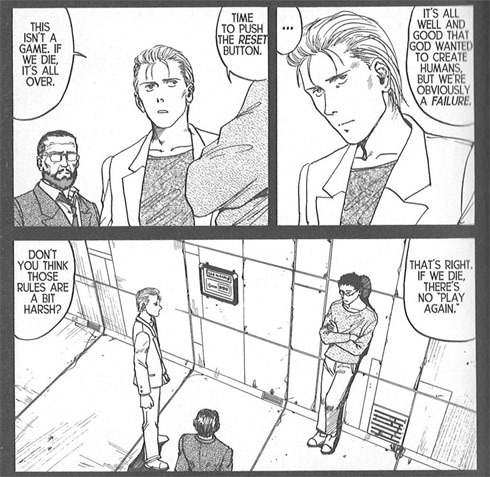 In what’s probably the longest chapter I’ve ever come across in a single manga volume, their past is revisited in several flashbacks, spanning the creation of the lab, the political and biological events that brought down the world around them, and the personal battles that lead them to the lonely existence they seem doomed to eventually die in. It will come as little surprise to any potential reader that visitors do show up one day, and although I won’t give away just who or what they are — partly because I avoid giving away spoilers just as much as I avoid reading them, partly because the geopolitical details of the plot would need more than a paragraph to recap — their arrival effectively banishes the survivors from their Eden and sets up the rest of the story. Oh, and that’s just the prologue, as chapter two flashes forward 20 years into the future. 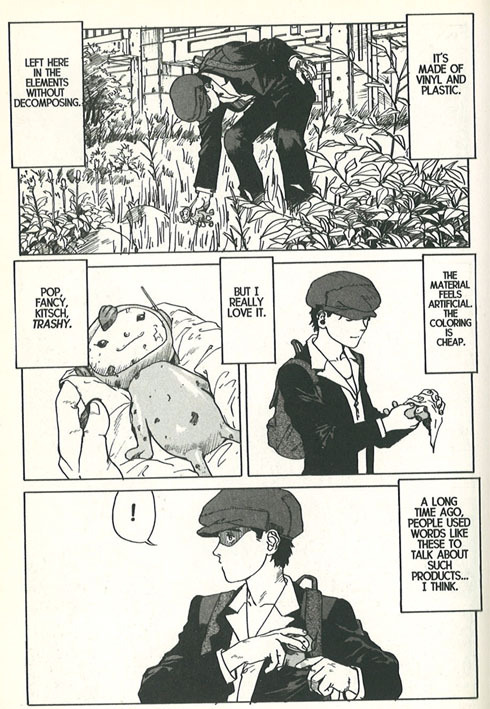 We meet the central protagonist (at least of the first three volumes) Elijah Ballard, a teenage boy who eeks out a living foraging and looting on his own in an abandoned South American metropolis. His life is a lonely struggle, albeit a peaceful and idyllic one set against the backdrop of a city in decay, streets slowly being overtaken by weeds and even trees, where wild dogs prowl the block and designer clothes still hang on racks in stores for the taking. There’s an eerie beauty to these scenes, one that’s almost dreamlike until you remember just how real they almost are. Elijah is resourceful enough to make the best of his situation and introspective enough to ponder the meaning of it. For anyone who’s ever wondered what it might be like to have a corner of the world all to themselves, Elijah is a likable and sympathetic hero who you’ll enjoy spending time with. But much like the characters in the opening chapter, his life is soon turned upside down by some unexpected visitors. What does their arrival reveal about life on Earth after the outbreak? Eden: It’s an Endless World! is a thoughtful and immersive story, an unflinchingly gritty meditation on the ugly business of life and death. Hiroki Endo’s artwork is richly detailed, his characters expressive and emotional, and his settings worth getting lost in all on their own. I’ll be the first to admit that I’m not the most seasoned reader or comics or manga, but for whatever it’s worth, I don’t know if I’ve read any other title that’s packed so much detail into each page. The world of Eden isn’t for the feint of heart: it’s a testament to Endo’s skill as an artist just how disturbing some of the more gruesome panels in this volume are, and what I’ve seen of further volumes only dials this up. But there are lighthearted moments as well. After an attempt to harvest coconuts from treetops by hand goes bad, Elijah resorts to using a rifle to shoot its fruits down to the ground. “If this were a comic, they would’ve fallen when I hit ’em,” he moans, after only managing to blow his targets to bits. Eden also incorporates many elements of cyberpunk, a genre that I usually enjoy tremendously, despite how passé it’s viewed these days. So far, it’s one of the only things keeping Eden from being a completely plausible story that could conceivably be set in our own world. Will it play a significantly bigger role in the story to come, or just spice things up along the way? Obviously, it’s too early to tell which way the story will turn, but I’m excited to find out.